In the latest Debate @ The Waite, “Australian cities need Australian Farmers”, Professor Wayne Meyer spoke about the future of natural science and the challenges that South Australia faces. Professor Meyer led an in depth discussion into the issues that confront South Australia and debated the future outlook for the state. 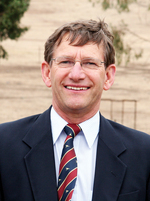 This entry was posted in LFP, Podcast and tagged debate, farming, Podcast, South Australia, Wayne Meyer. Bookmark the permalink.